It's a jungle out there! 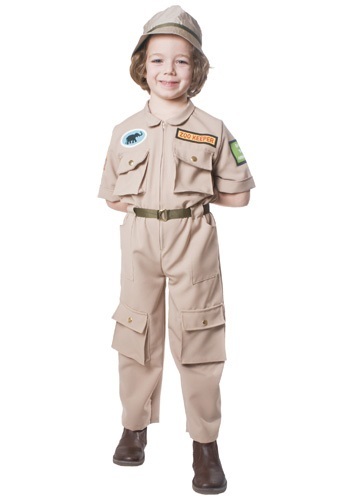 The Kids Zookeeper Costume includes a tan, short sleeve, polyester jumpsuit with matching hat and belt. A zipper along the front allows for quick and easy changing, while an elastic band around the waist provides a comfortable fit. The front of the suit has two patches on the chest; a blue elephant patch and another that reads "Zoo Keeper." The sleeves also have patches sewn into them. One reads "Save the Animals," while the other features a picture of a zebra. The jumpsuit also features 3 sets of pockets: a set at the chest, one on each side on the waist and one on each pant leg at the knee. An olive green belt, made of a rugged satin material, fits around the waist through belt loops on the suit and adjusts with a metal buckle in front. The bucket hat is made of a matching tan polyester and features a light green band. Zookeepers have the best animal adventures!